Wood flooring can be refinished to make it look like new. One of the main benefits of solid wood flooring is that dull looking and even damaged floors can be rejuvenated by the refinishing process. And because solid hardwood is about three-quarters of an inch thick, refinishing can occur several times over the life of the floor, which can last for decades. Not only can the flooring be cleaned up to look like new, the color of the floor can be changed in some cases. When changing the color is the primary goal, then this step fits within the overall floor refinishing process. Many people believe that refinishing always involves sanding down to the bare wood. It doesn't. 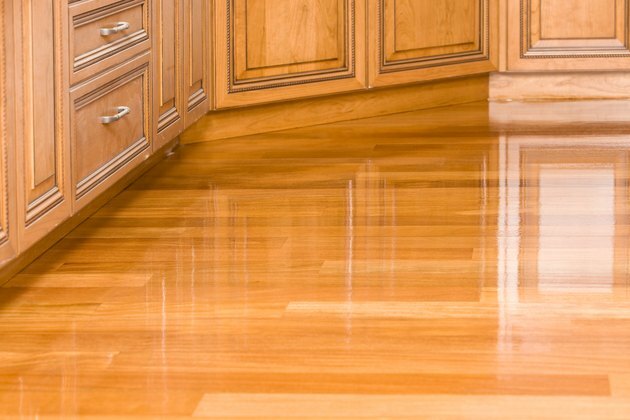 Wood floors are protected by a clear coating that can lose its luster over time. Polyurethane is the most common floor coating. To revive the finish, a flooring contractor, or you, can screen the floor, which involves roughing up the surface of the finish without penetrating down to the wood. The finish needs to be screened so that a new coat of polyurethane can bond to the old. The process is sometimes called buff and recoat because a floor buffer rather than a floor sander is used in the screening process. The contractor will attach the screen to the bottom of the buffer and then systematically move it over the floor. A special handheld edging tool is used on the last few inches of flooring in the corners and around the perimeter that the buffer cannot reach. The flooring contractor then vacuums up the dust and then applies a coat of polyurethane. The cost is about $1 to $2 per square foot for this level of refinishing. Screening is not a level of refinishing that works if your goal is restaining to create a new floor color. For that, you'll need to go to full refinishing. Screening only works on floors that are coated with polyurethane. Floors with wax finishes cannot be screened. If you are unsure about the finish on your floor, speak to a professional flooring contractor. 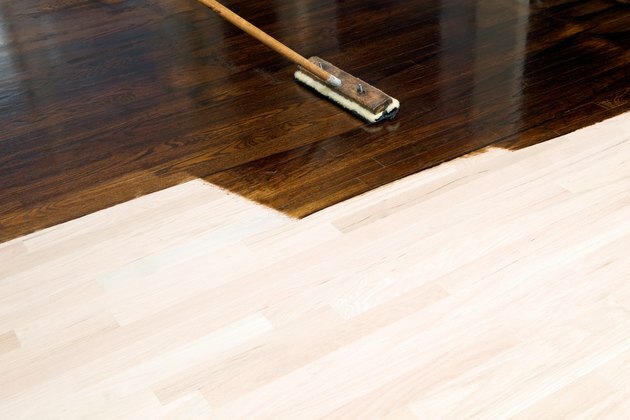 This is the process most people envision when someone mentions refinishing or staining a floor. In this process, the contractor uses a drum sander to remove the finish and sand down to bare wood. The technique removes the old finish as well as light scratches and minor imperfections in the wood itself. A drum sander removes the old finish as well as scratches and other imperfections on the surface of the wood. The contractor starts by using a very coarse-grit paper on the machine. He will follow up with at least two more passes using finer grits with each pass. The coarser grits remove the finish and top layer of wood; the finer grits remove the sanding marks left by the coarser grits. A special handheld edger tool sands areas where the large sander cannot reach. 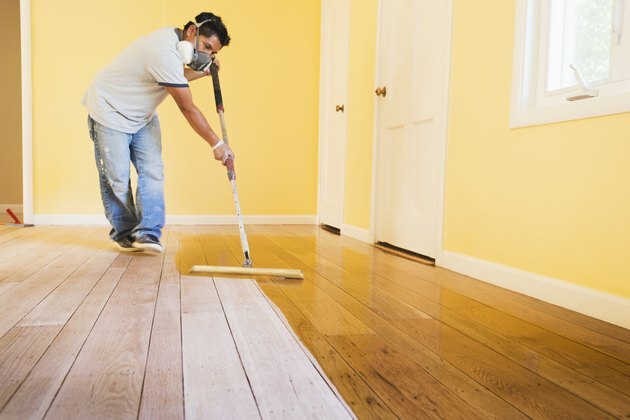 Once the sanding is complete and the room vacuumed, the contractor can either apply a stain to the floor and then apply a clear polyurethane protective coating. Or the contractor will apply a clear polyurethane coating without staining. The choice to change the look of the wood with a stain is a matter of personal preference. But be aware that some species of wood do not accept stain as well as others. Dense-grained woods like maple or birch do not accept stain well and may be best treated with just a surface finish. Coarser grained woods, such as oak, can be very well suited for staining. It's best to discuss your options with a flooring expert. Stain changes the look of the wood. Some species, like oak, take stain better than others. 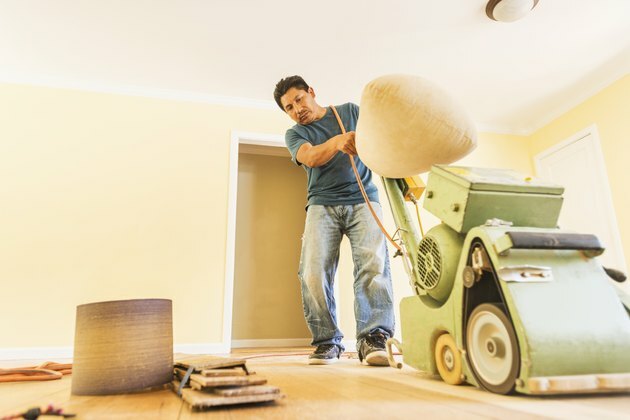 A good contractor will use a vacuum system attached to his sander to remove as much dust as possible. He will also seal off the rooms he is working in with plastic sheets and tape, but be aware that some dust will probably migrate to other areas of the house. Repairs. Floorboards that are buckled, cracked or missing must be repaired before the sanding process can begin. Room prep. The room will need to be cleared of all furniture and rugs, as well as anything hanging on the walls and window treatments. Some contractors will do this, but it is sometimes left to the homeowner. For sanding multiple rooms, renting a storage pod that is placed outside of the home to hold the furniture is an option. Because most of the cost of a professional refinishing job goes to labor charges, doing the work yourself will net big savings. And floor refinishing equipment is a popular rental item. Polyurethane coatings are available in oil- based and water-based formulations. If you are unfamiliar with the equipment, ask the rental agent to demonstrate how it is used. Drum sanders can damage the floor if not used properly. Drum sanders can weigh over 125 pounds and you may need help getting some of the equipment in and out of your car, and up to the rooms where you will be working. You will also need to purchase screens and sanding papers for the machines. It is best to overestimate in this area because you can usually return what you don't use. You will also need to buy tarps, tapes, and plastic sheeting to seal off the area. Good quality stains and finishes usually run $40 to $50 per gallon. Check the product's label, but a gallon of stain can usually cover from 400 to 500 square feet.